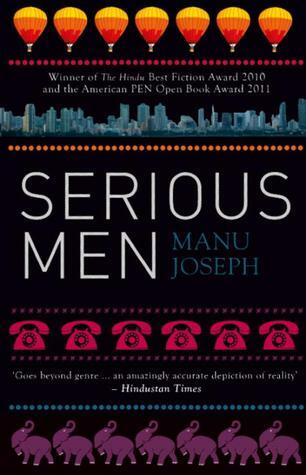 "How serious is this book about Serious Men?" I asked my friend mockingly, who couldn't help but recommend this book to me at every turn of any bookish conversation. "Not very much and at the same time, totally," he said. I could not make a word of it but then thought to myself, could it really hurt to try? And one fine sleepless night, tired from the lack of doing anything serious I dived into SERIOUS MEN. I confess it has been one of my best uncalculated decisions that has made my self-belief about random reading even stronger. Ayyan Mani, has been against casteism and the fact how his forefathers; who were dalits, suffered at the hands of Brahmins, is at the heart of this story. He does not want a similar fate for his son Aditya, and quite literally, Ayyan leaves no stone unturned to blur away the dalit stigma that has leached onto their lives, threatening to debauch his son's future. Everyone else in the story, Arvind Acharya, the Director of the Institute where Ayyan works, Oparna, Lavanya Arvind, Jana Nambodari, Oja Mani, etc, fill the gaps to be pedestals to Ayyan's schemes and to complete his story and the fight against casteism. Manu Joseph is a meticulous writer, not only in his prose but his thinking. His stellar attempt at satire blended with bone-tickling humor, and the eye for details, make this book a masterpiece. I wasn't able to put it down, simply because the stories of Ayyan, of Arvind, of Oparna, and the many hundreds living at BDD, are a part of our very own ecosytem in Mumbai. Sign into Goodreads to see if any of your friends have read Serious Men. 11.45% "“What is the saddest sight in the world? A couple weeping together. At their failed love, or at the ruins of their home demolished by the municipality, or at the funeral of their child. There is something about a man and a woman weeping together. Nothing is more heart-breaking.”"
17.77% "“What he had in his mind was so simple and clear, but when asked, for the first time, to express it through the inadequacies of language it seemed so difficult and even plebian.”"